Sometimes I read Refinery 29's Money Diaries. I thought I'd try out that format for my budget post this month. May 1st: A pair of earrings from AU Rate arrive in the mail! I'm doing a sponsored post with them and the earrings are quite lovely. You'd think I'd be satiated for the moment, but instead I finally decide to pull the trigger on a pair of custom earrings from Etsy. I thought I'd get an Amex Credit, but I realize too late that seller only does Paypal, so I have to spend the full amount. May 2nd: It's crazy hot today. I have a blogger event this evening at 7:30 p.m. and didn't bring lunch to work. Because I'm dying of hunger and know dinner is a long way off, I place an order with Uber Eats. I don't like spending money on lunch, but my wrap is delicious and I avoid the low blood sugar slump that usually ensues when I skip lunch. I decide the event is a good opportunity for the inaugural wear of the little black dress I got at TJMaxx a couple months ago. As it's a blogger dinner, I only have to put in for part of the tip. May 3rd: I'm running low on my beloved Tazo chai tea concentrate, so I start to put together a Target order. I do not buy the cute scalloped leggings I want, but do throw in a new dry shampoo I want to try. May 4th: My Gap credit card rewards came in and are immediately burning a hole in my pocket. I place an order for a pair of striped culottes, taking a chance on the small petite and a black jumpsuit in a size small. May 5th: Today I have another blogger event. I forgot to check the Facebook messages before I left so I had no idea the time was moved an hour later. As it was an hour drive for me and I don't know the area, I end up sitting in my car passing the time on my phone. Instagram ads alert me to the fact that the gingham maxi dress I'd wanted to order from Old Navy yesterday is now back in stock in my size. I place an order for it and a gingham skirt too - just to try. May 6th: I go to Madison with my mom for outfit photos. We get coffee at Willoughbys, and I'm sad they don't have my beloved ginger cookies. She treats today. May 10th: I go to Starbucks for their half price happy hour drinks. May 11th: I meet Courtney at Lyman Orchards to take photos in the apple orchards. I can't believe I've never been to Lyman Orchards before and can't get over how huge it is! We shoot for nearly two hours and I'm famished when we are through. We decide to grab dinner based on what Yelp recommends and head to Tap and Vine in Wallingford. I take a chance on pork carnitas tacos and I'm not disappointed! May 12th: I go to Westport for a wax, then stop for breakfast. I also want to go to Ann Taylor, but I'm shocked when I find out its shuttered since I was there just over a month ago! I head to Banana Republic, and want to buy a black straw hat, but it's not on sale, so I hold off. I go to J.Crew to see if the silk bodysuit I want is on sale and it's not either. I stop at Starbucks, then head home. May 13th: It's Mother's Day, I buy my mom some plants and give her a gift card for the spa. Despite my instagram story poll that did not rate in favor of the red dress from Nordstrom, I decide that maybe I just need to exchange it for a smaller size, so I do. May 14th: I think my power strip is dead, so I order a new one. Turns out it's my flat iron that is on the fritz, so now I need to plan on buying a new one. I have another blogger dinner at Tisane Euro Asian Cafe in Hartford. I spend too long trying to decide what to wear and am running late. When I arrive there is nowhere to park and I immediately move into stressed mode. Cars honk and me and part of me wants to turn around and go home. Eventually I decide to park at the bank across the street. The event turns out to be so good. We have nearly the whole patio to ourselves, and the food just keeps coming! Everything is good, I meet some new bloggers, and I'm glad I persevered through the annoying parking situation. May 17th: I've been obsessing over getting a coin pendant necklace. I place an order for a couple from TJMaxx.com. One seems promising, the other is mainly to get free shipping. May 18th: The straw hat at Banana Republic is on sale. I cave and place an order. May 19th: I go to the spa for a facial and pedicure. It's gross and raining out. When I get home, I change into comfy clothes and spend the rest of the day watching the royal wedding. May 20th: I'm meeting a friend for coffee and need to stop at Old Navy to return the gingham skirt and exchange the dress for a larger size. I locate the dress and realize the check out line is super long. I think if I browse for a bit it might dissipate. It does not. I find a jumpsuit. There is a coupon for $20 off a $50 purchase, so I rationalize that the jumpsuit will be free. When I finally get through the line, I'm told the coupon can't be used because the jumpsuit is a clearance item. I get it anyway. I quickly pop into Bed Bath and Beyond to grab some essentials. May 24th: My hat arrives smushed into a small box. I'm annoyed the brim is misshapen. I try to fix it by piling heavy books on it overnight. The conditions improve slightly, but I still want to exchange it. I find out my favorite Banana Republic in Fairfield as also shuttered! May 25th: My TJMaxx order arrived and I don't love either of the necklaces. I impulsively decide to just get the Julie Vos coin necklace I really want, but considered too expensive. Since I was there, I also got a pair of sale earrings because they reminded me of a Chanel pair. I signed up for the email list to get free shipping on the order. 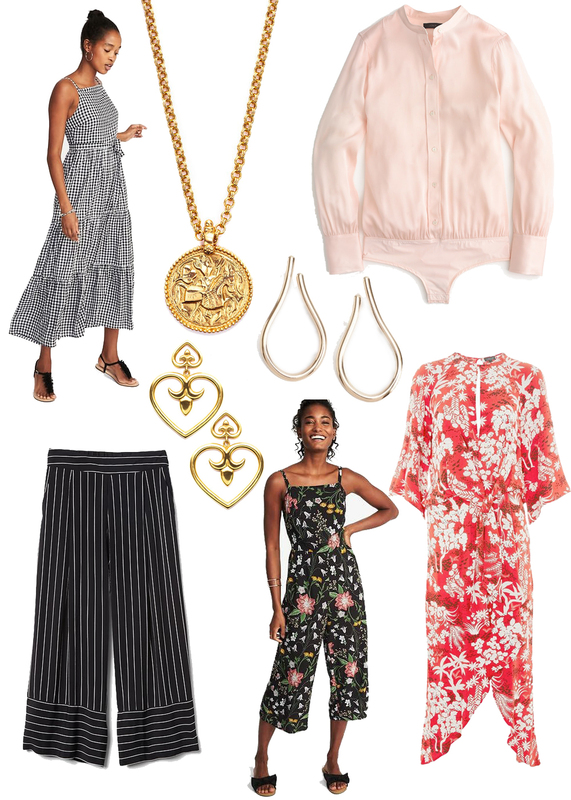 May 29th: I think I've made it through the rest of the Memorial Day Weekend sales without making a purchase, but while I have idle time I work I find myself on J.Crew's website. Turns out the sale is still going strong and with free shipping. I get the silk bodysuit. I read Money Diaries on Refinery29 religiously, so I absolutely loved the format of this post! So much, in fact, that I am considering whether I might want to do my own. I don't give much thought to my monthly spending, because I am pretty routine driven, so my expenses don't change a lot month-to-month. Still, I think it would be fascinating to track this in some way and, since June starts tomorrow, I think I just might! I love that gingham dress and the red one!!! This way of doing your May budget was so fun! You got to go to so many blogger events this month! Wish I was invited, haha! I've never ready money diaries via R29- but I love this format! That coin necklace is SO gorg, lady! This is a fun format! You got some gorgeous jewelry this month! I love that coin necklace! I read Money Diaries every so often. This was such a fun post and I love what you got! It's amazing that you're so mindful about all your purchases. I really need to try this as I sadly forget just about everything I spend money on within a few days of doing it and then am mystified and disappointed in myself when I see my bank statement or balance my accounts at the end of the month. I need to start reading this! I was doing so well this month until I had the bright idea to go to Target and look for a new bathing suit (in my defense, I haven't bought a new bathing suit in over 5 years). Of course we emerged with $200 worth of stuff. How does that happen?? That jumpsuit is the best ever!! Ah! I'm so glad you bought the Julie Vos pendant you love! I seriously wear my jewelry of her's everywhere. It holds up really well! I like this format for your posts! I think it would be interesting to keep track of spending like this. I usually only tally up the fashion spends I have each month, but this is a good way to get an overview of all your spend :) Sounds like you had a fun month with lots of events! Lovely picks dear. That gingham maxi dress is the cutest! Love its simplicity and timeless style. I love this diary + budget format, it made for a really fun read. It was like shopping with you :) Maybe knowing that you'll record your purchases this way will help you stay accountable to your budget goals if that's something you want to do--I think it would help me! Oh and I think you spent a lot =!= I dont even want to add it up ! Did you? The trousers are similar to a vintage pair i got a few weeks ago.